A young startup called Relativity is pushing space technology forward by pushing 3D printing technology to its limits, building the largest metal 3D printer in the world. And other major companies anxious to try these new ways of manufacturing, too. Science correspondent Miles O’Brien looks at some of the amazing advances that’s launching the technology into a new era. Whether it's with plastic, metal, or even living tissue, 3-D printing has been around since the 1980s. It's been used mostly for prototyping. And, so far, it's still cheaper to make most large-volume consumer goods like bottle caps using traditional methods. But, as Miles O'Brien reports, recent advances could launch 3-D printing into a new era. It's the subject of tonight's Leading Edge story, which airs every Wednesday. Just another day in an office park near LAX. No clue to the travelers above that a whole new approach to manufacturing is under way beneath their feet. It's happening at a young startup called Relativity, a team of for-real rocket scientists pushing space technology by pushing 3-D printing technology to its limits. Here, they are printing rockets, nose cone to nozzle. Rockets are the lightest-weight, most expensive, largest, difficult-to-make thing, that really 3-D printing is the optimal solution for. Founders Tim Ellis and Jordan Noone both realized this while working at large established aerospace manufacturers, where 3-D printing has been used for decades to make prototypes or a few parts here and there. They figure technology now makes it possible to think bigger. But to do this, they first had to build something bigger, the largest metal 3-D printer in the world. We made our own printing head, where we have aluminum wire fed in by this nozzle here. And then we're using 11 kilowatt fiber lasers to actually melt the aluminum. As you feed in material on the right, then the laser melts it. So, it's a very, very powerful laser. It can actually blind you from over 50 kilometers away. Good thing they aren't evil geniuses. Their mega-printer is called Stargate, a three-armed, 15-foot-tall robot. It hasn't made a whole rocket yet, but it has printed out a fuel tank and an engine. Relativity's full-throttled thrust into 3-D printing is just one milestone on the long road from prototypes and small parts to mass manufacturing. Mechanical engineer John Hart is director of the Laboratory for Manufacturing and Productivity at MIT. I'm certain we're in early stages. I think that the things that we do with additive manufacturing, in the end, say, 10, 20, 30, 50 years from now, are in some part beyond our imagination. Hart is not talking about consumer-grade 3-D printers, a passing fad that peaked in 2014. He and his team at MIT are developing new materials and machines to help make 3-D printing more practical for manufacturers. They're grappling with familiar obstacles. 3-D printing is slow. It's expensive, right? There's few things that you can 3-D print and then use right away. You often have to do post-processing and finishing and painting, et cetera. But we're getting there. Hart and colleagues founded a company called Desktop Metal to develop a solution. Traditionally, 3-D printing works by fusing metal powder together layer by layer with a laser. It's a single-point process limited by the speed of the laser. At Desktop Metal, they alternate layers of metal powder with a glue-like binder. The layers are sprayed with multiple print heads, inkjet-style. After the part takes shape, it is placed in a furnace, where the blast of heat fuses the metal while cooking away the binder. The company claims the process is about 100 times faster than the single-point laser technique. Based outside of Boston, Desktop Metal is growing fast. CEO Ric Fulop gave me a tour of his factory for factories. This is the main event right here, right? This is our production system. This is the world's fastest metal printer. This machine can make a 150 metric tons of metal per year, 150 metric tons. There's nothing else like it. The production-scale metal 3-D printer is slated for its first delivery to customers early next year. The machine is well-suited to make higher-end, lower-demand parts like this. This is a part made in our production system. This is for BMW. That's a water impeller that goes inside a water pump. But 3-D printing is also spurring another revolution, in industrial design. The technique enables the creation of objects unimaginable using traditional tool and die techniques. The company is designing with software made smart by the artificial intelligence technique called machine learning. And here's the ironic twist. The machine is designing parts that appear to come from nature's playbook. Check out these two parts, on the left, a sleek human design, on the right, the rootlike handiwork of a smart computer. Andy Roberts is a software engineer. You have tested this, and what happens. What we find is that the parts have been self-organized so that they distribute the strain evenly across the parts. So, there are no sort of hot spots where you get a crack forming, for example. So, this is better than a human could do? Oh, yes. It is better than a human could do. It may be some time before organic-looking parts take root. But, in the short-term, some big players, like BMW and Caterpillar, are anxious to try new ways of manufacturing their current designs. A lot of customers for industrial printing do get it. They have been working with the technologies for many years, studying them, prototyping with them. And there's this urge and thirst for mass production. I wouldn't have said this three to five years ago, but I'm convinced of it now, because you see more demonstrated applications. If 3-D printing delivers on these promises, it will do much more than upend the process of manufacturing. The ripple effects are far-reaching. From how the designer or the engineer goes about their work, to what the factory looks like, to how business agreements are structured, to where factories are placed, to what production workers do on a daily basis, it's all going to happen. And I like to think the goal is to get ahead about the understanding and the vision and help make it happen. At Relativity, they are still developing designs and printing processes, but they have reason to believe they have launched a good idea. They printed this giant, 14-foot-tall fuel tank in a matter of days. A traditional manufacturer would have taken a year. But, for Relativity, the real proof is in the testing, and they have successfully fired their printed rocket engine 85 times at NASA's fabled rocket testing center in Mississippi. So, that's like a fully printed design would normally be almost 3,000 parts, but we have gotten it down to three, and really shown that that's robust and that it works. By the end of 2020, the team hopes to be delivering satellites and other payloads to low-Earth orbit with fully 3-D-printed rockets. They predict they can cut the cost of even the cheapest flights today by more than 80 percent. A game-changing number like that would destine manufacturing for a tectonic retooling layer by layer. For the "PBS NewsHour," I'm Miles O'Brien. 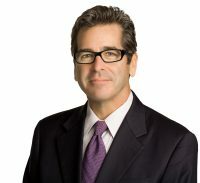 Miles O’Brien is veteran, independent journalist who focuses on science, technology and aerospace.